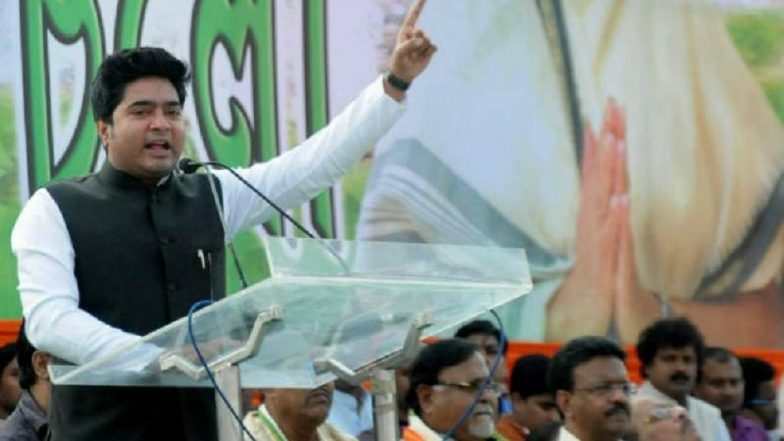 Kolkata, March 24: Trinamool Congress MP Abhishek Banerjee and his wife Rujira Banerjee were stopped by Custom Officials at the Netaji Subhash Chandra Bose airport where they landed from Bangkok earlier on Sunday. The couple were charged of violating the norms by carrying 2-kg of gold without disclosing to the authorities. The incident snowballed into a Kolkata Police vs Customs Department case after the Vidhan Nagar Police Commissioner, who was reportedly called by Abhishek, intervened in the matter and escorted away the accused duo. CBI vs Kolkata Police: Mamata Banerjee Accuses BJP of Torturing West Bengal. An FIR was later filed by the Custom departments, naming Abhishek and Rujira, along with the Kolkata Police officials who have been charged of "interference, obstruction and criminal intimidation" of Customs Officials. Following the incident, the BJP was quick to train guns at West Bengal Chief Minister Mamata Banerjee, who is the aunt of Abhishek. Accusing the CM of shielding her nephew, the party has demanded an independent probe to be conducted by the Central Bureau of Investigation (CBI). "When Custom officials stopped Abhishek Banerjee's wife at Kolkata airport, Vidhan Nagar Commissioner came to the airport, threatened the custom officials and entire luggage was taken without checking. We demand a CBI inquiry in this incident," said BJP general secretary Kailash Vijayvargiya. Abhishek, meanwhile, has refuted reports that two kg gold was seized from his wife's baggage when she recently landed here from Bangkok. "If that was so, why wasn't it confiscated? Was the 'chowkidar' sleeping?" Terming the reports as "baseless and politically motivated", he said his wife was "not carrying even two grams of gold" or any other dutiable or objectionable item in the baggage. He claimed that the commissioner of Customs Kolkata Zone had written to a junior officer to file an FIR against his wife on instructions from the Central Board of Indirect Taxes and Customs, New Delhi. The Trinamool Congress leader, who heads the party's 'Yuva' wing, wondered how a covering letter by the commissioner, which was marked 'secret', could land in the hands of a television news channel. Abhishek, who called a press conference at his office at Amtala in South 24 Parganas district here on the matter, alleged that the BJP was indulging in personal attacks against his family members, after having "failed" to fight the TMC politically.